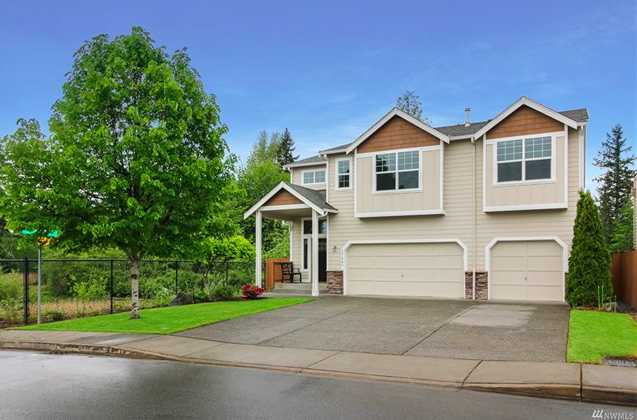 Beautiful Open Floor Plan on Quiet Street Next to Green Space & Mt Rainier Views! Nearly 3000 Square Foot Home w/Fireplace, Main Floor Den, Bonus Room & 4 Spacious Bedrooms Upstairs. The kitchen with island, Features Solid Hardwood Floors, Granite Counters, Stainless Appliances, Plentiful Cabinets, Counters & Pantry. The 2 Story Entry w/Spindle Staircase Leads you to Sumptuous Master Suite w/French Doors, Fireplace & Huge 5 Piece Bath w/Soaking Tub, Walk-in Shower & Walk-in Closet. "We were referred to Tara by a mutual friend and met with her a few years before we seriously decided to buy. When we finally decided we were ready, she was almost immediately responsive and remained that way through the entire process. We had taken the first time homebuyer class the year before, but still had a million questions that Tara was always able to answer quickly. She was able to work with our weird availability schedule and was still able to show us every house we wanted to see. We got lucky and fell in love with the sixth house and within 48 hours, she'd helped us make a successful offer under asking price. I'd happily recommend her to anyone who was looking to purchase."